The emergence of “smart” or “digital cities” is fueled by the need to find new solutions to old problems, driven more by innovation aside from new technologies. Cities need to understand how development of startups in their localities can address the urgent requirements of their growing population especially in the urban areas. By opening government to its citizens especially in the area policy innovation, creating traditional and online platforms to solicit solutions, governments are able to harness ideas of the communities. Policy makers would have to take a step back an analyze how nurturing an entrepreneurial mindset among its young people can lead to solutions for their own cities. The mission appears to be huge, seeing the number of key actors who will play a vital role in eventually creating smart solutions. By cities, we mean smaller groups within a country and its various regions, districts and provinces that live as one cohesive unit in a distinct location or area within a nation, availing of or sharing common services under one government instrumentality. Normally a city itself is distinct from its political body that governs it which is usually referred to as local government. Hence, citizens, can always have good reviews about its own city, but not its local government. The recent Global Entrepreneurship Conference (GEC) + Taipei 2018 in Taipei last September 27-29 run under the theme “Enabling Social Impact with AI + IoT” provided interesting insights on policy innovation for creating smart cities. One of the GEC’s highlights is a panel focusing on “Entrepreneurship Nurturing: Interaction between Thriving City and Startup Growth” and Taipei, hosting the GEC for the first time, is an ideal venue for this discussion. Taipei city government established its Taipei Smart City Project Management Office (TPMO) in 2016 to introduce innovative solutions and become a matchmaking platform for public-private partnership. The goal is to transform the whole city into a living lab and make creativity as Taipei’s DNA. More details can be found in the Smart City Taipei website. Taipei City focuses on five major themes: Smart Transportation, Smart Public Housing, Smart Healthcare, Smart Education, and Smart Payment. According to its website, by adopting Proof of Concept (POC) model, Taipei open up its fields to all kinds of innovative solutions for trial. Taipei adopts a holistic approach towards becoming a smart city. The design hits three major targets that complements each other but are three distinct and separate thrusts, namely, bring innovation into government cross-cutting projects and smart city projects, open up channels of communication, allowing citizens to communicate directly with authorities; and provide industry opportunities and promote innovative solutions through proof of concept (POC) model. Digital Minister Audrey Tang shared during the GEC how Taiwan has initiated open governance. Tang, a Taiwanese free software program known as one of Taiwan’s great minds in computing, as a minister without portfolio joined the cabinet in 2016. Since then, she has been working closely with policy makers and implementors to initiate tech-driven solutions for social problems and needs of the country and to bridge the digital divide between generations. Taiwan has trailblazed open governance to create solutions on a regular basis. Tang, a digital activist, started vTaiwan, known as an experimental platform in participatory governance where civil society is collaborating with government and knowing its functions. vTaiwan consist of open-source tools for collecting policy proposals, information sharing, open debates on issues and holding polls. The project faces several challenges especially on the side of traditional and conservative government leaders. Cities in the Philippines have a lot to learn from Taiwan’s model, notwithstanding, the targetted initiatives have begun seven years ago. In 2012, the National ICT Confederation of the Philippines (NICP), in partnership with the Department of the Interior and Local Government (DILG) under the late Jesse Robredo, and the Cyber City Teleservices Philippines Inc. (CCTP) launched the Awards for Excellence in Governance through ICT for Local Government Units (eGov Awards). The eGov Awards recognizes local government units (LGUs), these includes cities, provinces and municipalities in the Philippines, for their best practices in utilizing ICT to effectively and efficiently deliver its public services directly to its constituents and other stakeholders. This year, the eGov Awards was adopted by the Digital Cities PH framework of the Department of Information and Communication Technology (DICT), a new department create only in 2016. DICT continues the project under its Digital Governance component with the same objectives, which are to highlight and encourage the effective and efficient the delivery of services and performance of the duties and responsibilities by LGUs using ICT as major tool and to share and replicate innovative practices, and commend, collate and document LGUs in integrating ICT in their processes to serve as example and benchmarks to other LGU’s. The program also aims to improve the business development, social services and the general ecosystem of the LGUs and motivate the private and business sector to actively participate and/or invest in the growth of the LGU’s and to promote citizen’s responsibility and participation as well as accountability, efficiency and transparency in governance responsibility and encourage innovation. First, focus on the social problem that needs to be solved and not the technology. The idea that revolve around available the technologies and resources is an erroneous approach. The goal is to create significant positive change by directly addressing a problem, a bottleneck in the government system or service and to find and design solutions. One POC is the Taipei Main Station application which provides real-time guidance to the public not only about information on train schedules and routes but where to shop, dine and find immediate services. The system comes with indoor navigation barrier-free functionality with maps, locations and directions. The system as a complete companion to point our nearest ticket counters, ATM, rest rooms and other points of interest and facilities. The technologies are designed to be user-friendly and responsive. The Philippine eGOV Awards calls for four criteria – innovative management or the degree to which the system explored, applied and managed the elements and “outside-the-box” strategies that brought about its success; impact or the major results of the system, their effects and benefits to the recipients of the service; relevance or how the entry relates to the overall objectives of the local government for a particular segment or sector; and replication potential and sustainability. Impact and relevance are emphasized to ensure that solutions are not only about the technology but how it addresses the concern. Second, harness citizens participation of open governance is generating solutions. Taiwan has been a trailblazer in operationalizing open governance to create solutions on a regular basis. Their system allows citizens to suggest and propose solutions for real problems experience and crates a process flow that eventually leads to experimenting, prototyping and institutionalizing solutions that are found to be effective. Governments of cities must be open to suggestions from its own citizens as much or even more than external vendors since end-user feedback directly addresses major pain-points, thus allowing solutions to evolve and become more effective. By focusing on the solutions, the view that technology is an expense, and usually expensive, will change to it being an investment that eventually yield social returns. The focus of Smart Taipei is on the social issues and solutions and not the technology. Technology becomes a tool to address the bottlenecks, problems and concerns of the community. Third, create strategies to encourage startup companies which have the technical knowledge as well as the passion to effect social impact to participate in building smart cities solutions. Programs and avenues to develop the entrepreneurial mindset of young people is an important aspect. Startups are mostly composed of millennials, who are out to make a difference but would mostly need support from government and various sectors. By creating an ecosystem that facilitates the emergence of startups, giving them the needed support in various areas like funding, mentorship, incubator or accelerator facilities, legal services and business development will need to be in place. Attention must be given to key issues affecting viability of startup companies to compete with large and well-established companies in bidding for smart city contracts. Two areas cited during the GEC + Taiwan conference were intellectual property and compliance. For countries like the Philippines, a more robust promotion of intellectual property rights is needed especially for tech startups. The over-arching need, however, is for policy to support innovation. The three key points discussed could be more effectively addressed with the present of policies that will drive processes to become more responsive not just disruptive, for generation of ideas to be more inclusive and for startups to become formal sources of innovative solutions towards building smart cities. 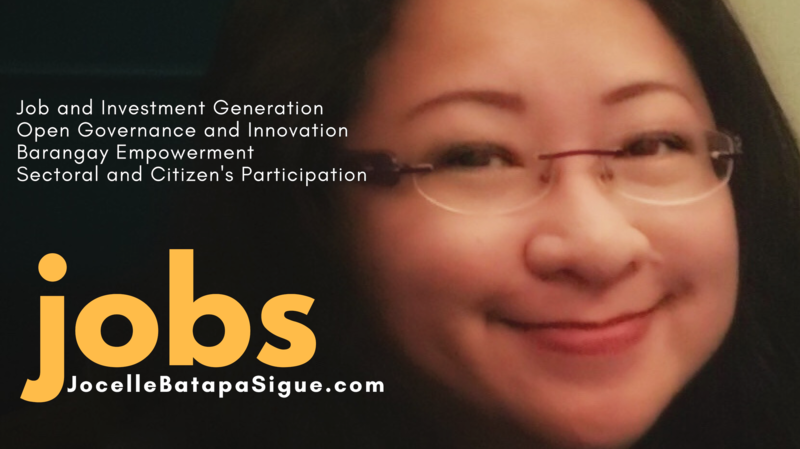 About the Author: Jocelle Batapa-Sigue, a professor and attorney-at-law, and co-founder of the National ICT Confederation of the Philippines and the Philippine ICT Innovation Network is one of 13 fellows selected to be part of the AVPN Policy Leadership Lab from June 2018 to June 2019. This Lab is a Fellowship programme designed and operated by Asian Venture Philanthropy Network Limited, a funders network headquartered in Singapore, representing 500 members that mobilise capital and resources for impact in Asia-Pacific (“AVPN”, http://avpn.asia). The Fellowship is possible with the partnership of BMW Foundation, whose Responsible Leaders Network underscores their support for programmes that cultivate policymakers that take leadership roles to achieve the Sustainable Development Goals. The Lab cultivates the next generation of social economy policy leaders across Asia by identifying policymakers who share the commitment to build a vibrant and high impact philanthropy and social investment community in their countries. Building on the AVPN Asia Policy Forum (APF, http://avpn.asia/asiapolicyforum) and BMW Foundation’s Responsible Leaders Network, the Lab offers high-touch and in-depth peer-learning, networking and capacity building opportunities for a select group of policymakers with AVPN membership and stakeholders. This leadership experience leverages on annual programme cycle of AVPN’s Asia Policy Forum, Membership and Knowledge Center activities and BMW Foundation global activities (where applicable), to provide extensive opportunities for learning and connecting with stakeholders that share the similar experiences and objectives. She will explore policy strategies in creating seamless education to employment goals anchored in the development of Future of Work skills, specifically digital skills among tertiary level students. Her direction is to engage policy makers from local to national level in government, academe and business sectors. Jocelle looks forward to collaborating with various institution to achieve the goals of the Fellowship.